The Magic Hutch: It's Time for Corned Beef and Cabbage! 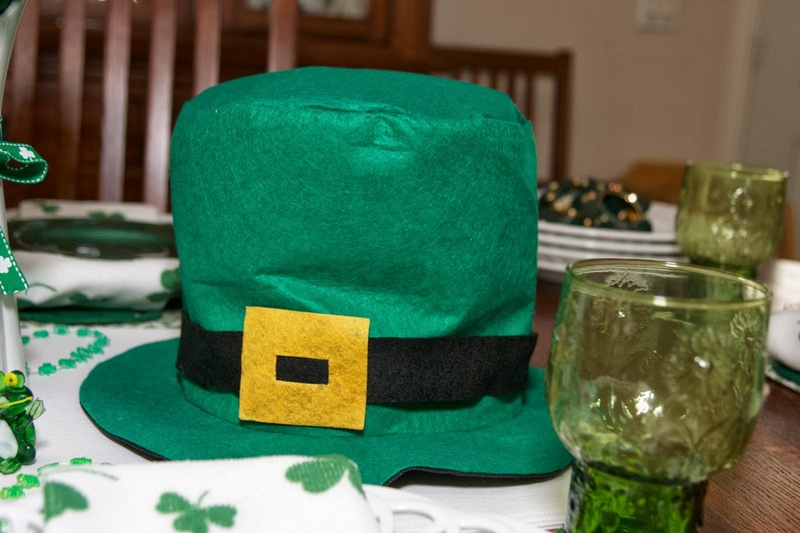 It's hard to believe that March 17th is almost here, and it's time to celebrate St. Patrick's Day again! I always look forward to cooking Corned Beef and Cabbage on this day (love that one pot meal! ), but this year, I'm adding a festive tablescape to the plan. 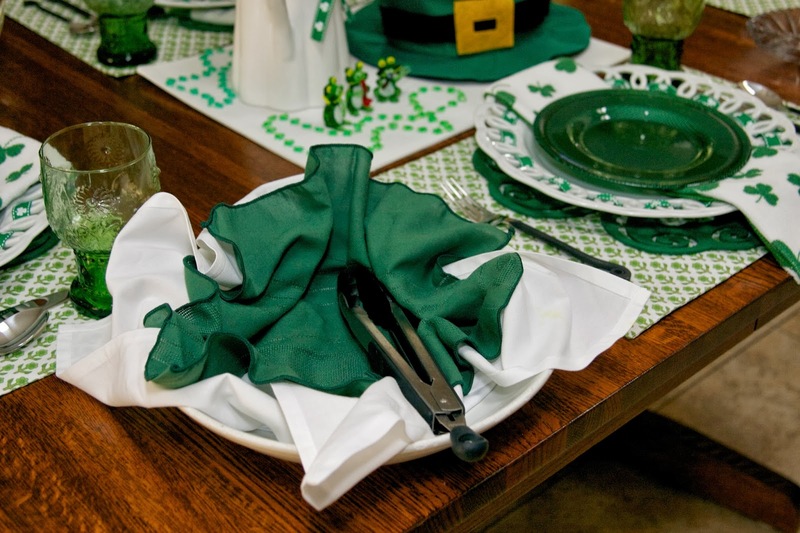 Green is absolutely my favorite color, and I was surprised to realize when I started planning this tablescape that I really didn't have green dishware in my stockpile of dishes. As a new tablescaper, I think I was concentrating on collecting neutral colors, along with the brightly patterned dishes I have always favored. So, without breaking the "monthly tablescaping budget", I had to get creative for this post. I started with a placemat I had gotten at Pier One on clearance. It's reversible and I think I'll get lots of use from it as spring and summer approach. 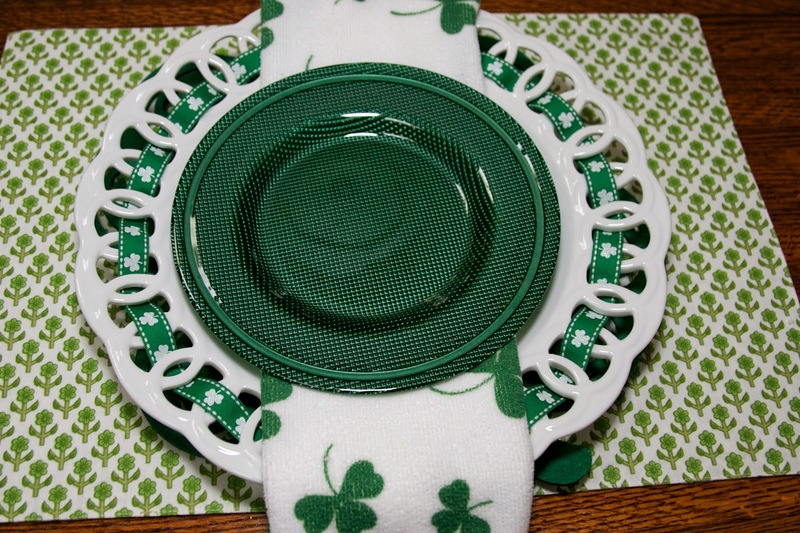 Next came a shamrock placemat I found at Dollar Tree. I used my Open Scrollwork chargers from Maryland China Company. http://tableforonetablescapes.blogspot.com and http://thewelcomedguest.blogspot.com for an idea I saw on their website. I intertwined St. Patrick's Day ribbon from Michael's through the charger border to make them a St. Patrick's Day accessory. 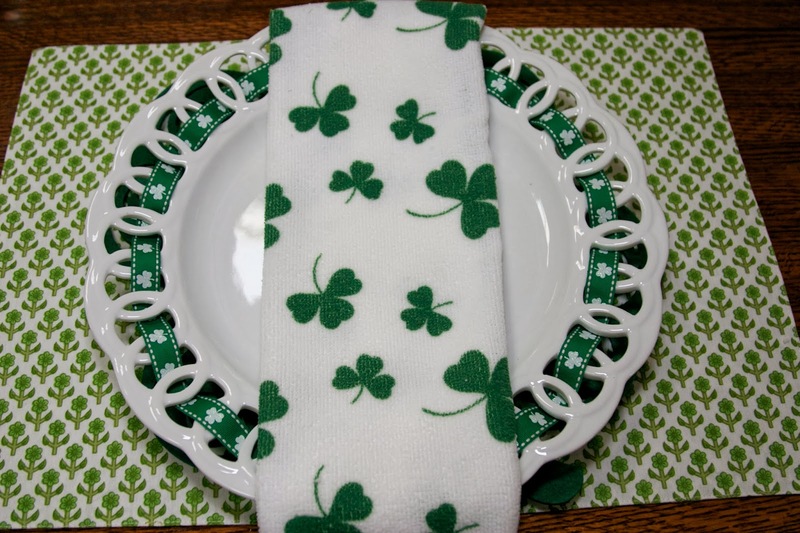 These tea towels are from Dollar Tree and I just love the shamrock pattern! They make for a large dinner napkin, but at least everyone's laps will stay clean! I did make one plate purchase at Home Goods for this table. These green glass dishes are labeled, "Villa Collection, Made in Turkey", and were on clearance for $2.00. I stopped my dish stack here. 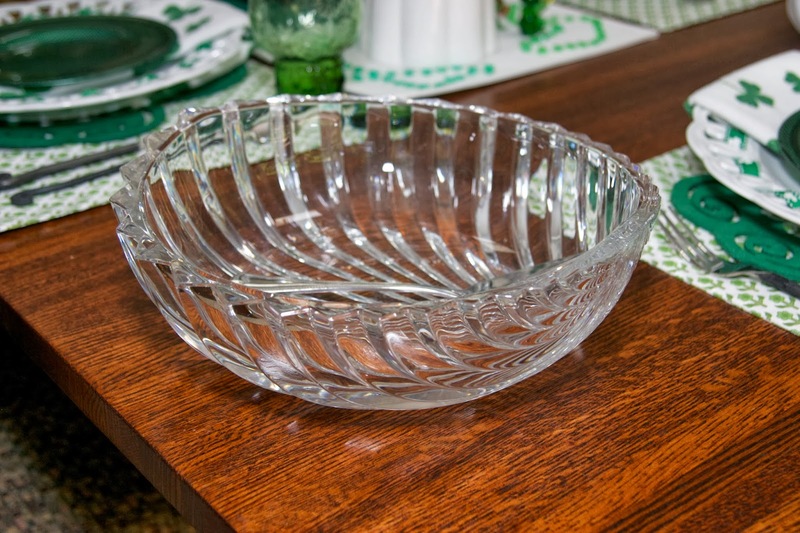 I usually do a buffet on St. Patrick's Day, so we'll start with salad at the table. The centerpiece starts with one of my white placemats from Macy's. I had bought this white vase at Marshall's and felt it would be a good addition to my tablescaping larder. It is marked "Farval, Made in Portugal", and is perfect for holding flowers. The green carnations are from Dollar Tree and the "baby's breath" is from Michael's. I added two necklaces of shamrocks from Dollar Tree, but still felt something else was missing. 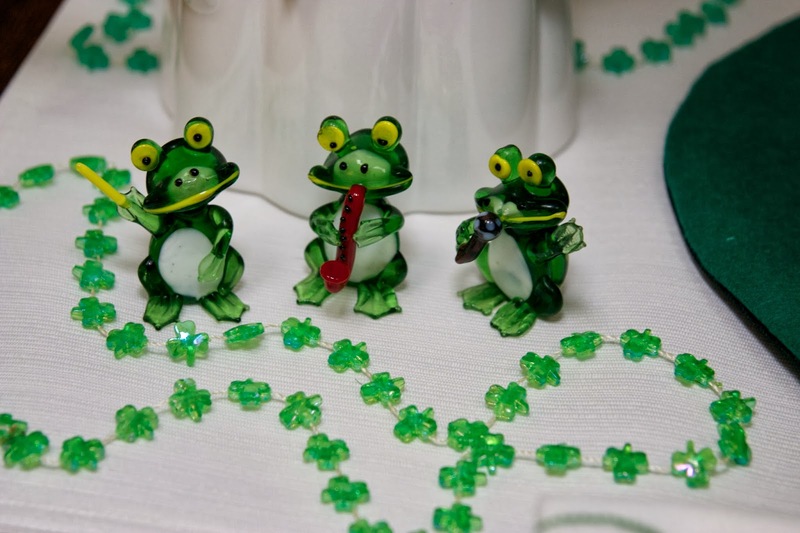 I looked at my hubby's "frog collection" and decided these Murano Glass frogs were the perfect color and looked like they were playing an Irish Jig! So---they became part of my St. Patrick's Day table! The leprechaun hat was from the Dollar Tree store, too. It was just too cute to pass up. I wonder who will end up wearing it after dinner!? 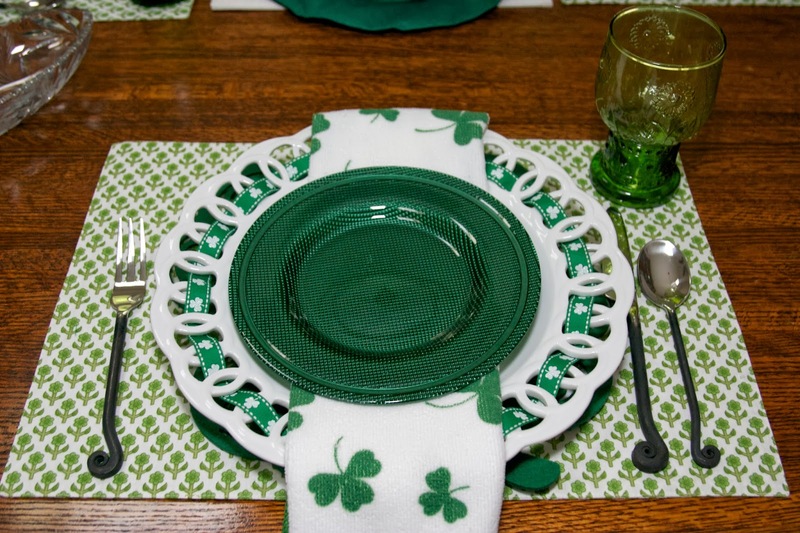 After salad, everyone will pick up a Metaceramica dinner plate from the table and head to the kitchen to serve themselves corned beef, cabbage, and boiled potatoes and carrots. 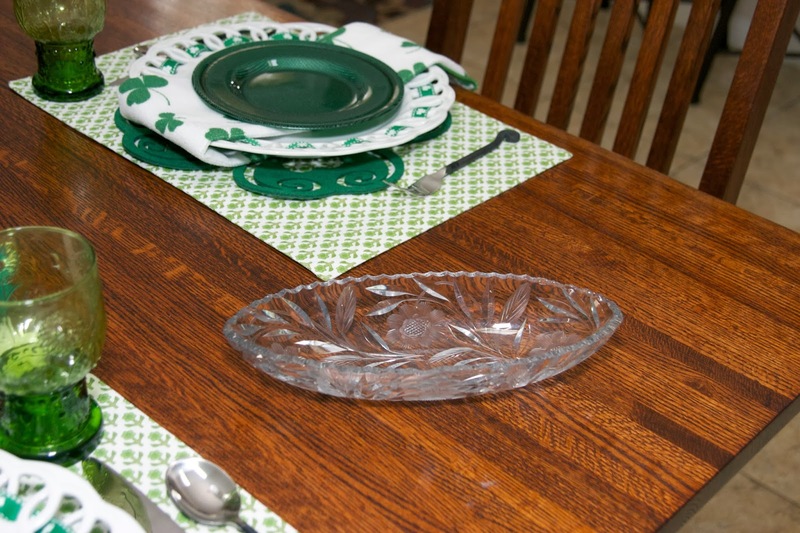 The serving pieces on the table are for applesauce, extra vegetables and Irish Soda Bread! Yum!!! I can almost smell dinner right now!! Happy St. Patrick's Day, everyone!! I really stayed in budget for this tablescape. It's a good thing The Dollar Tree store is close by and Home Goods is not far, either!! 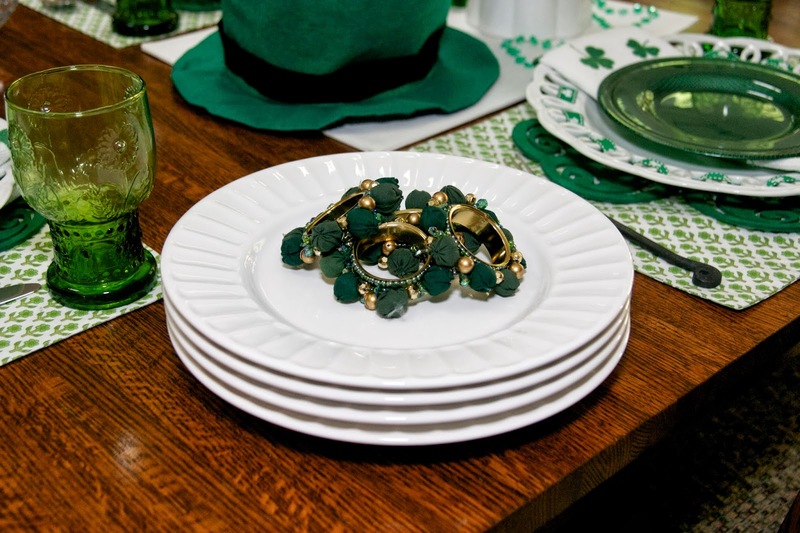 I'll be linking up to Susan's Tablescape Thursday at www.betweennapsontheporch.net and Kathleen's St. Patrick Day's Blog Crawl at www.cuisinekathleen.com. Be sure to join these parties to see what others have come up with. Thank you, Susan and Kathleen, for hosting!! If you'd like to become a follower of The Magic Hutch, just go to the top of my blog, fill in your email address where indicated, and hit "submit". Rosie, what a fun and festive table! Those chargers look wonderful -- and so versatile, for any season! I enjoyed reading how you assembled all the elements to set this table! this looks wonderful Rosie! You found some great things on the cheap! It looks beautiful! 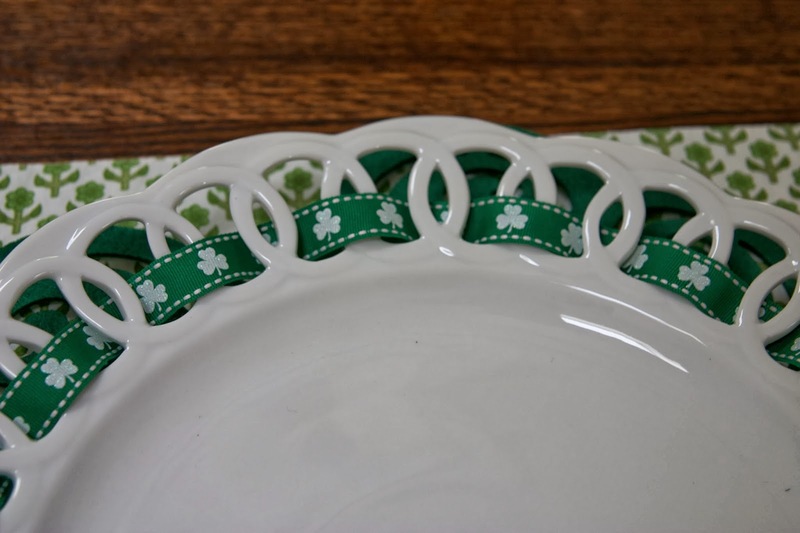 I love those plates you can run a ribbon through -- so versatile. And the little frogs -- it's so fun to find little things around the house to make a table special. 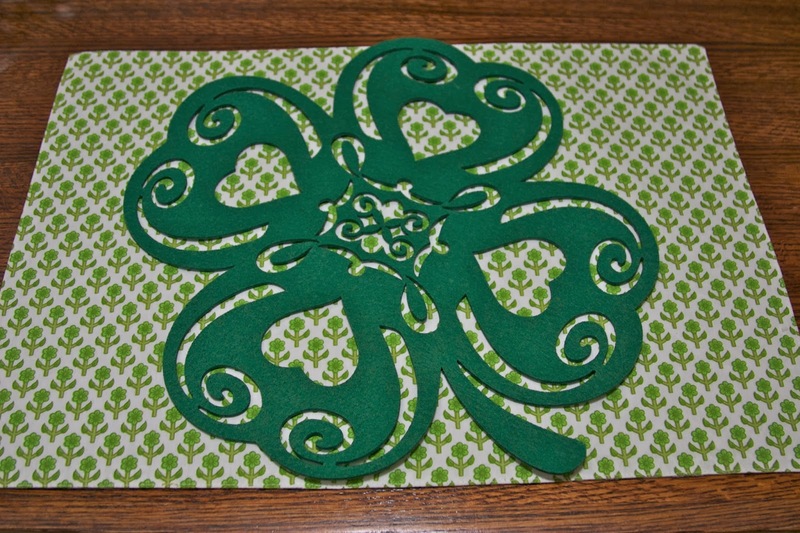 I love your place mats because they look great for St. Pat's but will be so much fun for Spring too! Fun fun fun! I prefer plates that are versatile, and running a ribbon through the edges is perfect for the holidays. Happy St. Patrick's Day. You are so clever! I live in a small town and we do have a dollar tree but they do not get the good things you found. Love the placemats. Your little frogs made me smile and they made your table unique. I also like your chargers. How pretty to weave the ribbon through your dishes! Really great idea! As most of your earlier comment the use of the ribbon is very special. 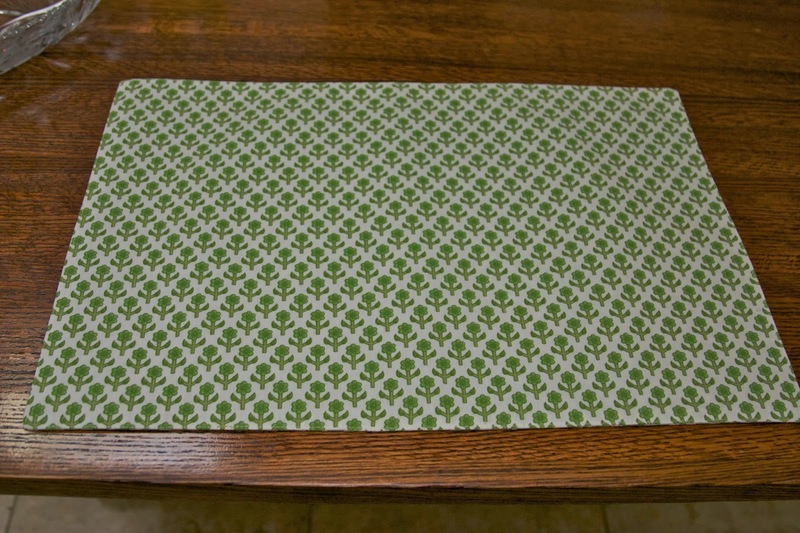 You found four leaf clover placemats, I found some very similar except mine are St Paddy's hat. Beautiful job! I like the ribbon laced chargers- great idea! You've done a great job of putting this together and with so many good deals! I snickered at the little frogs! Great tablescape with some clever inspiration. 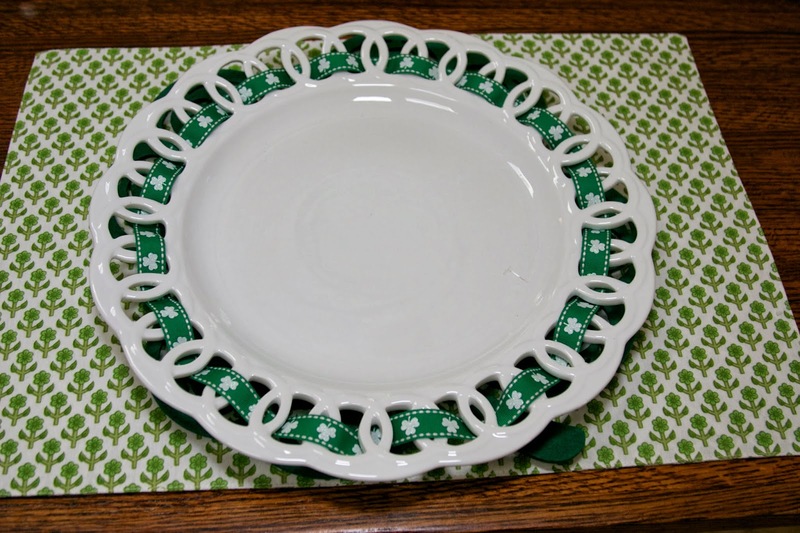 Love your table and how you weaved the ribbon through the lacy plates. Cute frogs too. Visiting from the crawl. What cute details! You've set a fun and festive table. Happy St. Pat's Day! Beautiful place setting. Love the centerpiece! What a wonderful table! I love the ribbon on the Maryland China chargers! What a fabulous touch! You are definitely ready for the big day on Monday - have fun!! Love your table, Rosie! That was genius to use the ribbon to create your St. Paddy's Day chargers! Such a wonderful table! You got a steal on those salad plates...love them! If your plates are large or very heavy I would use more wire, maybe an extra one so that it's held in 6 places. Most of my plates are saucers, salad and dinner. The larger platters have the older store mangers. I like this for the odd shapes and when I want a plate put on a wall anytime. I have a 20-guage wire too, but it's not as pliable. When you try this, let me know how it worked for you. BTW you have a 'no-reply' in your settings so when you make comments I get an email with your comment but I can't rely to your email. Fun table, Rosie! I love those little frogs. Hi Rose! This is great, so gad you joined in ! I love those new green plates, terrific buy! Thanks so much for taking part in the 6th annual St. Pat's Bog Crawl! Slainte'! Dollar Tree is such a wonderland to fill out a tablescape without "breaking the monthly tablescaping budget" to badly! You found lots of terrific things to add to what you already have! Snaking that ribbon through the plate rims is a great idea!!! I haven't been to Dollar Tree in a long time. I didn't realize they had the leprechaun hats! I want one!!!!!!!!!! 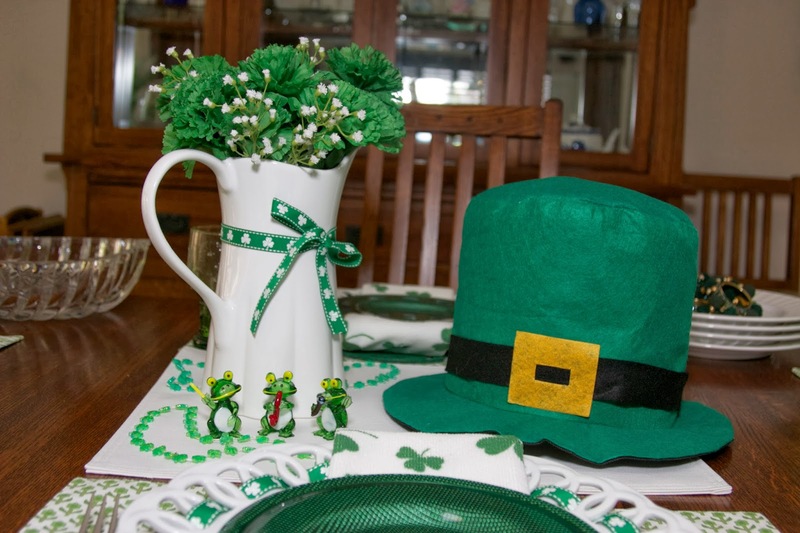 Have a really terrific St. Patrick's Day, and enjoy that soda bread!!! 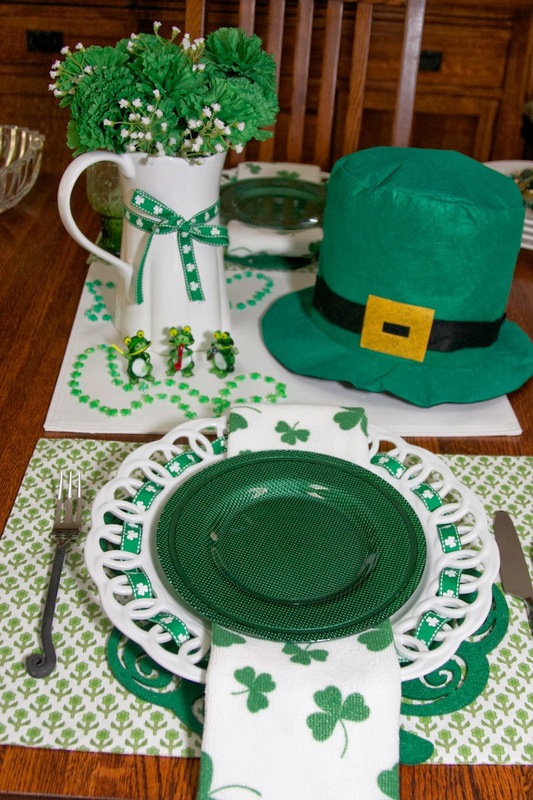 What a beautiful and festive table...St.Patrick's Day is such a special day in our family! Hope you had a wonderful one!! I love your table! Those chargers are so pretty and versatile!! I bet you use them a lot. Those frogs are too cute, too! Thanks for stopping by my blog! Enjoy your week!! 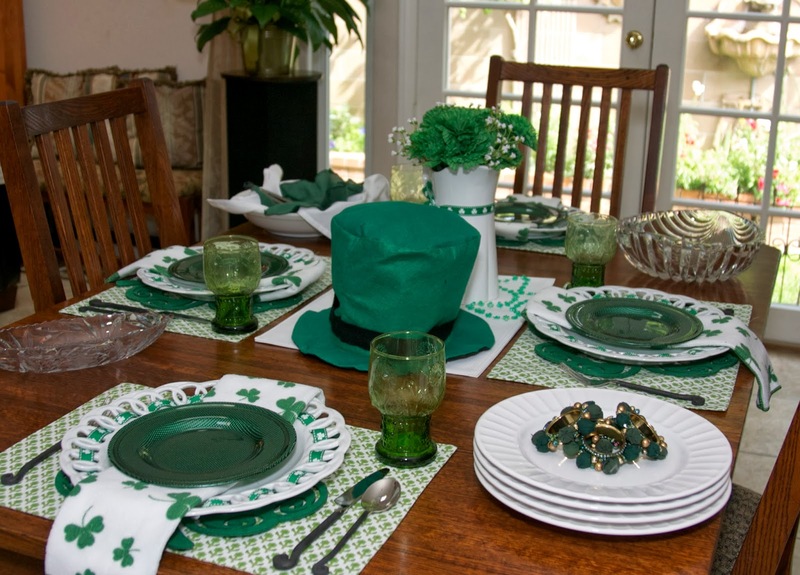 What a delightful St Patrick's Day table! 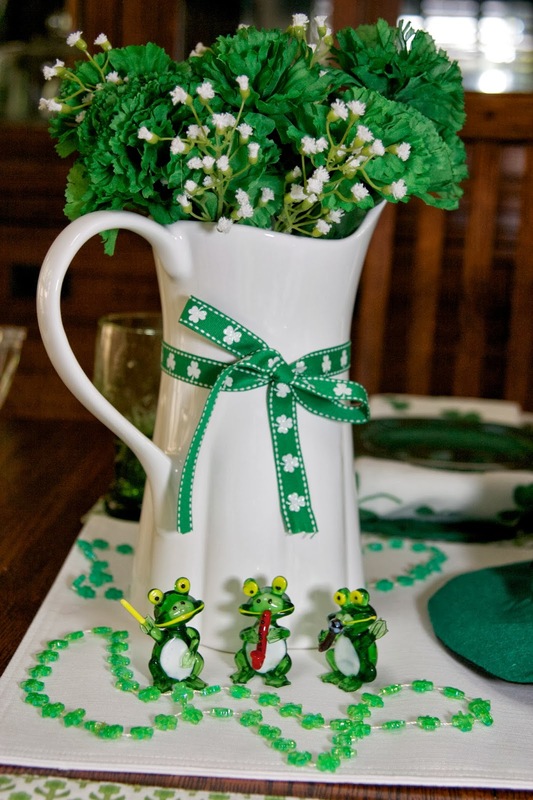 The frogs are a perfect touch of whimsey to make an already marvelous tablescape sparkle even more than it did. 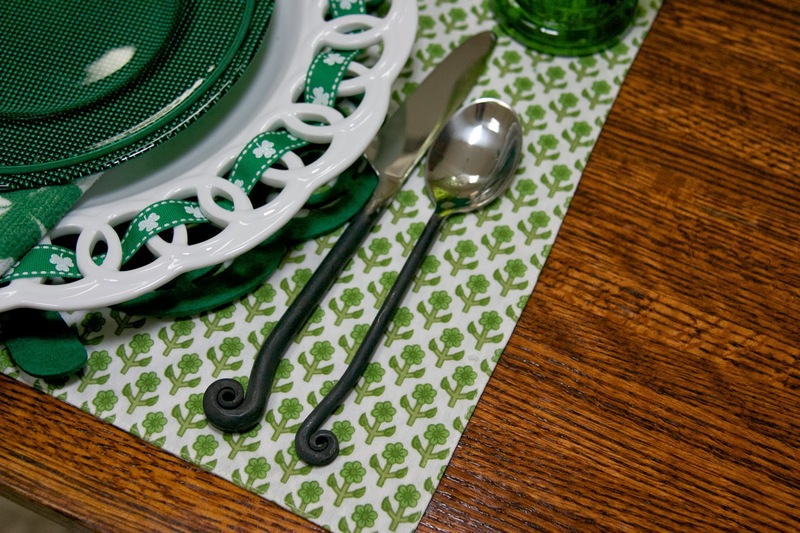 The tea towels are a great touch and the shamrocks work well with the placemats and the ribbon threaded through the open work on your plates..